All Aluminum: The DIAMOND DELUXE unit is constructed entirely of aluminum. This gives it years of durability while never cracking or needing to be repainted like other units. The exterior and floors are TREAD BRITE aluminum. The interior walls are smooth aluminum. The frame and structure is also entirely aluminum. Lightweight: Aluminum is lighter than steel or fiberglass. This lighter weight equates to less ear and tear on the vehicle as well as improved fuel economy. Insulated: All exterior walls are insulated with a corrugated plastic liner. This also aids in sanitizing the unit after use. Ventilated: Exterior is entirely Tread Brite aluminum. Doors have openable louvers to provide ventilation while keeping the animals hidden from public view. 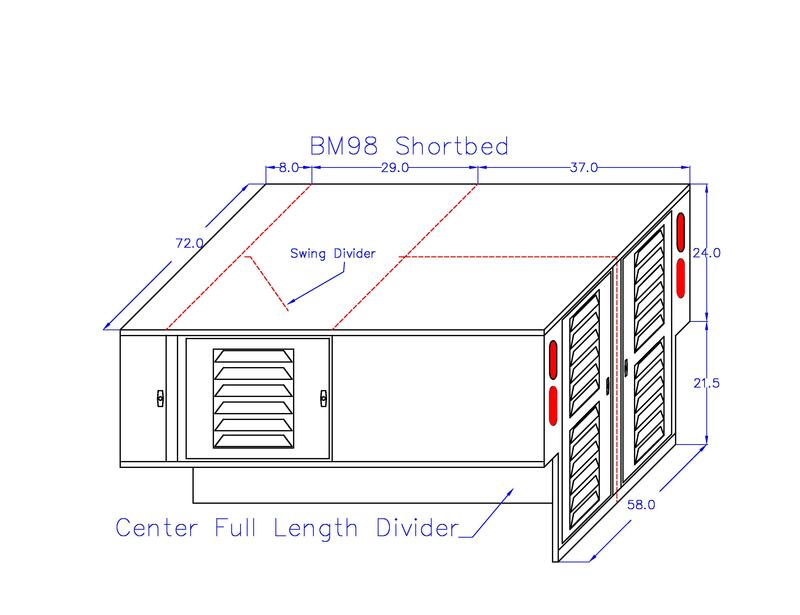 Swing Center Divider: Standard on all units is one swinging compartment divider/door. This can be opened up so the two compartments become one large compartment. 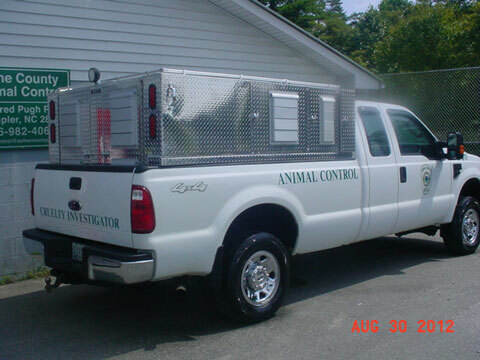 This can then be used for transporting large animals, traps, etc. 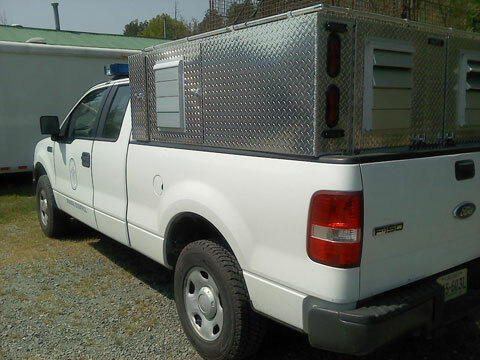 Storage Compartment: All units come standard with a locking storage compartment large enough for catch poles, tranquilizer poles, etc. Wash-Thru: Standard on all units is a 1 opening at the bottom of compartment dividers for wash-thru ability when cleaning after use. Rear Step Bumper: A steel step is standard on all chassis mount units. 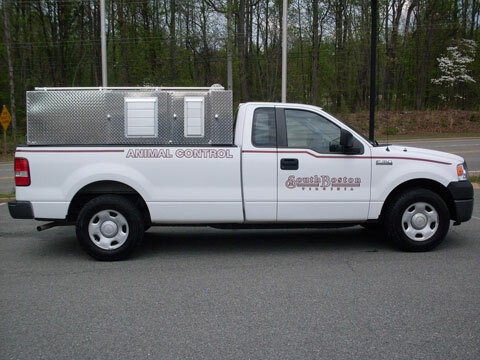 Sizes: All units are available for long wheel base or short wheel base trucks, full size or compact size. We can custom build to YOUR specifications. Skirt: The sides of chassis mount units are skirted to bottom of the body line. Hinges: Full length piano hinges on all compartment doors. Lights: Body lights and reflectors per Federal regulations. Warranty: Two year warranty on all DIAMOND DELUXE units. #2,3 20 wide X 24 tall x 36 deep Compartments for cats or small dogs. Solid partition with 1" opening at bottom for wash-thru. #4,5 28" wide X 24" tall X 36" deep These two compartments are the middle compartments. The center divider is hinged so it can be opened to form one large compartment for hauling large traps. #6,7 36 wide x 41 tall x 93 deep These two compartments are at the rear of the unit. Solid divider. No floor or side walls (use truck bed as sides and floor). These are the standard compartment sizes. 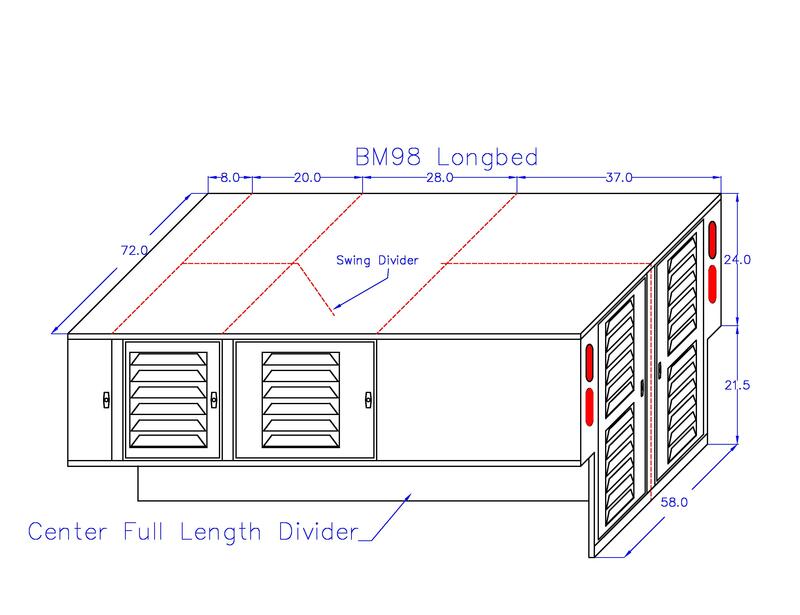 If needed, we can usually modify the dimensions to fit your specific needs with minimal, if any, additional costs.